SpeakEasy is an occasional poetry series that emphasizes themed, audience-friendly presentations of quality poetry by Cascadia-region writers. 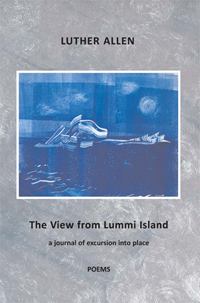 It is produced in Bellingham, Washington, by Luther Allen, author of The View from Lummi Island. SpeakEasy 24: For Love of Orcas will offer a selection of readings from the new book, For Love of Orcas (Wandering Aengus Press), edited by Andrew Shattuck McBride and Jill McCabe Johnson, an anthology that addresses the plight of the Southern Resident Orcas, Chinook Salmon, and their extended ecosystem. The event will be held at the Mount Baker Theatre Encore Room, Bellingham, Washington, on Friday, May 3, 2019, at 7:00pm. Admission is free and copies of For Love of Orcas will be available for purchase; the book’s proceeds will be donated to The SeaDoc Society. SpeakEasy 23: Poetry & Democracy presents Washington State Poet Laureate Claudia Castro Luna along with a curated selection of local poets offering poems “about timely and pressing issues, [to] spark increased empathy and understanding, encourage civic and grassroots engagement, and contribute to public debate and dialogue.” Additional poets include: Luther Allen, Anita K. Boyle, Sarah Brownsberger, Nancy Canyon, Linda Conroy, Roger Gilman, Rick Hermann, Lois Holub, Paul Hunter, Georgia Johnson, Peter Messinger, Jeffrey Morgan, Kevin Murphy, Tim Pilgrim, Rena Priest, CJ Prince, Janette Rosebrook, Jim Schmotzer, Carla Shafer, Carey Taylor, Gary Wade, and Leslie Wharton. SpeakEasy 23: Poetry & Democracy was held on Saturday, March 2, 2019, 7:00pm, at the Mount Baker Theatre Encore Room in Bellingham, Washington. Watch SpeakEasy 23: Poetry & Democracy on YouTube. SpeakEasy 22: Animal Beast Creature welcomes eight outstanding poets — Jennifer Bullis, Elizabeth Colen, Paul Hunter, Jeffrey Morgan, Bethany Reid, Kimberly Roe, Ely Shipley, and Sheila Sondik — who will populate the room with the power of animals: persona, myth, spirit, science, and a deep wildness. Please join us for another memorable SpeakEasy on Saturday, October 20, 2018, 7:00pm, at the Mount Baker Theatre Encore Room. Jennifer Bullis is author of the chapbook Impossible Lessons (MoonPath Press). Her two full-length manuscripts were recent finalists for the Moon City Poetry Award and the Brittingham & Pollak Poetry Prizes. Growing up in Reno, she built a one-girl pet-sitting and livestock-care empire and, at age 12, was able to buy a horse, whom she had for 25 years. At 30, she bought another horse, whom she had for 19 years, to be an old-age companion for the first. She misses all the cats, as well as birds, that she used to get to hang out with in horse barns. Elizabeth J. Colen is the author of What Weaponry, a novel in prose poems, poetry collections Money for Sunsets (Lambda Literary Award finalist in 2011) and Waiting Up for the End of the World: Conspiracies, flash fiction collection Dear Mother Monster, Dear Daughter Mistake, long poem / lyric essay hybrid The Green Condition, fiction collaboration Your Sick, and fiction collaboration True Ash, which was released in September 2018. Nonfiction editor at Tupelo Press and freelance editor/manuscript consultant, she lives in Bellingham with her ancient pup, Cally Maude, A.K.A. Dr. Dog, and teaches at Western Washington University. Since 1994 Paul Hunter has published fine letterpress poetry under the imprint of Wood Works. His own poems have appeared in Alaska Fisherman’s Journal, Beloit Poetry Journal, Bloomsbury Review, Iowa Review, North American Review, Poetry, Poetry Northwest, Prairie Schooner, Raven Chronicles, The Small Farmer’s Journal, The Southern Review, Spoon River Poetry Review, and Windfall, as well as in seven books and three chapbooks. His first collection of farming poems, Breaking Ground, 2004, from Silverfish Review Press, was reviewed in The New York Times, and received the 2004 Washington State Book Award. Three other volumes of farming poems have followed: Ripening (2007), Come the Harvest (2008), and Stubble Field (2012). He has been a featured poet on The News Hour, and eight of his short stories have been published by Clover: A Literary Rag. His latest book is Clownery: in lieu of a life spent in harness, an autobiography in prose poetry, published in 2017. Jeffrey Morgan is the author of Crying Shame. A 2017 National Poetry Series Finalist, his poems appear in Copper Nickel, The Kenyon Review, Poetry Northwest, Rattle, and West Branch, among others. He lives in Bellingham, Washington, with his wife, daughter, brother, and two cats (Siggy and Ramone). Bethany Reid’s most recent books are Sparrow, which won the 2012 Kenneth and Geraldine Gell Poetry Prize, and Body My House, which was released in 2018 by Seattle’s Goldfish Press. Although she has an MFA and a PhD in literature from the University of Washington, her poetry is more influenced by having grown up on a farm, waiting tables, and raising her three daughters. She and her husband live in Edmonds with two cats, numerous fish, and a very spoiled dog. Kim Roe is a professional horse trainer, riding instructor, and equestrian judge. She’s a graduate of WWU’s English program where she discovered she loves to wrangle words. Kim is the managing editor of The Northwest Horse Source magazine and writes articles for equestrian journals. She lives on her farm in Deming with her four horses: an autistic Lusitano named Exodus, Gunner the equine boy scout, old man Beowulf, and baby boy Gus, and her beloved and neurotic border collie, Cara Lou. She continues to help horses deal with their people. Ely Shipley is the author of Some Animal (Nightboat Books); Boy with Flowers, winner of the Barrow Street Press book prize judged by Carl Phillips, the Thom Gunn Award, and finalist for a Lambda Literary Award; and On Beards: A Memoir of Passing, a letterpress chapbook from speCt! Books. His poems and cross-genre work also appear in the Seneca Review, Western Humanities Review, Prairie Schooner, Crazyhorse, Interim, Greensboro Review, Painted Bride Quarterly, Hayden’s Ferry Review, Witness, Diagram, Gulf Coast, Fugue, Third Coast, and elsewhere. He holds an MFA from Purdue University and a PhD from the University of Utah. He taught for many years at Baruch College, CUNY in NYC, and currently teaches at Western. Sheila Sondik’s first wilderness was the empty lot next to her house in Hartford, Connecticut. The outdoors and its denizens have always been a source of wonder and joy. A stunning assortment of lizards glimpsed on a guided walk in Joshua Tree National Park in the 1970s and caribou encountered on a hike in Newfoundland were particularly memorable. She began writing Japanese form poetry in 2010, and is interested in the interplay between Western and Japanese forms. Her work has appeared in Kettle Blue Review, CALYX, Raven Chronicles, Frogpond, Modern Haiku, etc. She is also an accomplished printmaker. SpeakEasy 21: Poets Talk Poetry will feature seven distinguished poets reflecting on their own work, their inspirations, and the importance of poetry in their lives. The poets are Bruce Beasley, Ramona Elke, Jory Mickelson, Kevin Murphy, Nancy Pagh, Dayna Patterson, and Rena Priest. Please join us on Saturday, April 21, 2018, at 7:00pm, in the Encore Room of the Mount Baker Theatre, Bellingham, Washington. 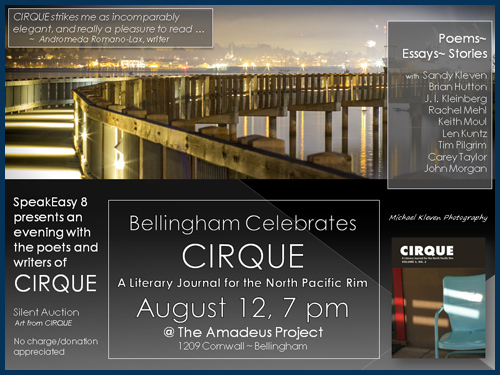 The event is free and the poets’ books will be for sale. Bruce Beasley is a professor of English at Western Washington University and the author of eight collections of poems, including most recently All Soul Parts Returned (BOA Editions, 2017). His books have won the Colorado Prize (selected by Charles Wright), the Ohio State University Press/Journal Award, and the University of Georgia Press Contemporary Poetry Series Award. More at https://brucebeasley.net. Ramona. L. Elke is a poet, playwright, and a student of belly dance who pays her bills with her skills as a history teacher/substance use counselor/poetry teacher to defiant adolescents in a small-town British Columbia high school. She has been practicing her poetry writing since the tender age of six years, when she was first published as the runner up in a Mother’s Day poem contest. Her poetry has been published the 2016 and 2017 Poetry Marathon Anthology and her chapbook, The Reluctant Daughter, is available on Amazon.com. Jory Mickelson is a writer, educator, and retreat facilitator whose work has appeared in Ninth Letter, The Rumpus, Vinyl Poetry, The Florida Review, Superstition Review, The Collagist, The Los Angeles Review, and other journals in the United States and the UK. He is the recipient of an Academy of American Poets Prize and is Lambda Literary Fellow in Poetry. His most recent chapbook, Slow Depth, was published by Argus House Press. He holds an MFA in Creative Writing from the University of Idaho. More at http://jorymickelson.com. Kevin Murphy has released two CDs of his poetry, Between Onions and Oxygen and The Bird of Pure Midnight, and a book, A Beautiful Chaos Demands Energy. He is the “poet-in-residence” of the Chuckanut Radio Hour and for 20 years, has performed poetry in the Pacific Northwest and beyond as a member of the New Old Time Chautauqua. He teaches poetry writing through the Whatcom Juvenile Justice Creative Writing Project and the Whatcom Community College Community Ed program. Kevin was awarded a Bellingham Mayor’s Arts Award in 2017. His poetry tends to be comic, surreal, and exuberant, and he frequently accompanies himself on guitar and percussion. He is working on a book of new, selected, and previously undetected poems. 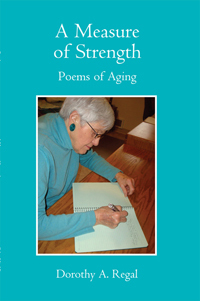 Nancy Pagh has authored three poetry collections (No Sweeter Fat, After, and Once Removed). Her writer’s guide, Write Moves, was published by Broadview Press in 2016. She was the D. H. Lawrence Fellow at the Taos Summer Writers Conference, received an Artist Trust/Washington State Arts Commission Fellowship, and placed second (of over 4,000) in the Wergle Flomp humor poetry contest. Nancy lives in Bellingham and teaches at Western Washington University. More at https://nancypagh.com. Dayna Patterson was raised in Utah and came to live in Washington by way of Ireland, Quebec, New Mexico, and Texas. She earned her MFA at Western, where she served as managing editor of Bellingham Review. She is the poetry editor for Exponent II Magazine and the founding editor-in-chief of Psaltery & Lyre. Her creative work has appeared or is forthcoming in Hotel Amerika, Sugar House Review, Western Humanities Review, The American Journal of Poetry, and Zone 3. More at https://daynapatterson.com. Rena Priest is a poet, teacher, and concerned citizen. Her first book, Patriarchy Blues, was released on MoonPath Press in May of 2017. She has recently been a Sustainable Arts Fellow at Mineral School, and her poem “Quiet Children” was nominated for a 2017 Pushcart Prize. She also recently had her first publication of a fiction piece in Nine Lives Later: A dead cat anthology, which was released in November. She is presently working on a fresh batch of poems and new fiction. She is a Lummi tribal member, and holds an MFA in Writing from Sarah Lawrence College. More at https://www.renapriest.com. Please join SpeakEasy 20 for an engaging reading of linked and recent work by Canadian poets Susan Alexander, Linda Thompson, Richard Osler, Barbara Pelman, and Terry Ann Carter. Three of the featured poets will also offer poetry workshops earlier in the day. See the poet bios and workshop descriptions on the SpeakEasy 20 page. In this time of post-truth and false news, SpeakEasy 19 presents heartfelt words of clarity and wisdom. Mount Baker Theatre Encore Room, Bellingham. Admission is free. Piano improvisations by Andrea Rackl. The Poetry Marathon challenges participants to write (and post) 24 poems in 24 hours (or 12 in 12 hours). Originated and organized by Caitlin Thomson Jans and Jacob Jans, writers and web publishers living in Cascadia, The Poetry Marathon is entirely free. In 2016, more than 500 poets worldwide participated in the full or half marathon. SpeakEasy 18 will present a number of participating poets from the region reading selections from their marathon output. Poets include Jessica Ankeny, Ramona Elke, Janel Erchinger-Davis, Jacob Jans, J.I. Kleinberg, Nancy Pagh, Silvester Phua, Paul Sarvasy, Harvey Schwartz, Sheila Sondik, Caitlin Thomson, Jeanne Yeasting, and Tobe Zalinger. The event is free and copies of the 2016 Poetry Marathon Anthology will be available for purchase. 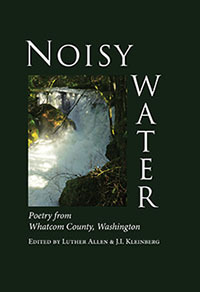 The reading is free; copies of Noisy Water will be available for sale. See more on the SpeakEasy 16 page. In honor of Valentine’s Day, local couples read poems — their own and their favorites — on love and all its entanglements. Click here to view or download a PDF of the SpeakEasy 13: Love Uncensored PowerPoint. SpeakEasy 12 was recorded by R.A. Hull, A Backup Experience. See the program and listen to the recordings on the SpeakEasy 12 page. Here’s a brief overview of SpeakEasy 11 posted by CJ Prince. Tell me, my friend, of the battles we have won. Tell me of the freedom that we saved. And I’ll lay here listening from my grave. Tell me of the men who fought by my side. ‘Less the truth decree that it was all in vain. So, sing to me gently and whisper to me mild. Fight on my friend and never shed a tear. Just why it was they sent us over here.